Dark matter is one of the great unsolved mysteries of modern astronomy. We’ve reached the point where we know most matter in the cosmos is made of matter that interacts weakly with light if at all, but drives much of the gravitational interactions between galaxies. While it’s often portrayed as a modern idea added simply to shoehorn observations into the standard model, it actually has a history spanning more than a century, and the theory of dark matter has been refined and improved as we’ve learned more about our Universe. The origins of dark matter can be traced to the 1600s. Soon after Isaac Newton presented his theory of universal gravity, some astronomers began to speculate about the existence of objects that might emit little or no light, but could still be known by their gravitational tug on bright objects like stars and planets. This idea was strengthened in the 1700s when Pierre Laplace argued that some objects might be massive enough to trap any light they emit (a simplistic idea of a black hole), and by the 1800s Urbain Le Verrier and John Couch Adams used gravitational anomalies in the motion of Uranus to predict the presence of Neptune. By this point astronomers had demonstrated the presence of dark nebulae, seen only by the light they absorb from bright objects behind them. It was clear that there was more in the Universe than could be seen by visible light. Our modern take on dark matter as a major contributor to galactic mass can be traced to Fritz Zwicky. In 1933 he studied the motion of galaxies within the Coma Cluster. The Coma Cluster is a galactic supercluster containing more than 1,000 galaxies. Since these galaxies are gravitationally bound, the speed of these galaxies can provide a measure of the cluster’s mass. Basically, the more mass the cluster has, the wider the distribution of galactic speeds following a relation known as the virial theorem. A few years earlier Edwin Hubble had estimated that the Coma Cluster contained about 800 galaxies, each containing about a billion stars. Using the virial theorem Zwicky calculated a cluster mass more than 500 times larger than that of Hubble. Zwicky noted that if his measurements held true “dark matter is present in much greater amount than luminous matter.” Over the next couple decades the virial theorem was applied to other galaxy clusters with similar results. Not everyone accepted these results, largely because the virial theorem is a statistical calculation that depends upon certain assumptions. For example, it assumes the clusters are gravitationally bound. Perhaps the galaxies in these clusters are actually flying away from each other, so that the virial theorem simply doesn’t apply. But there was another line of evidence to support dark matter. One that couldn’t be so easily dismissed. In the early 1900s astronomers began to look at the spectra of galaxies. From this they could determine the speeds of stars as a function of their distance from galactic center, known as a galactic rotation curve. Seen in visible light, most galaxies have a bright center, dimming as you move away from the center. This would imply most of the stars (and thus most of the mass) is located near the center of a galaxy. If that’s the case, one would expect stars far from the center to move much more slowly than stars near the center, just as in our solar system Earth orbits the Sun much more quickly than distant Pluto. When Max Wolf and Vesto Slipher measured the rotation curve of the Andromeda galaxy, they found it was basically flat, meaning that stars moved at the same speed regardless of their distance from galactic center. One solution to this mystery was that Andromeda is surrounded by a halo of dark matter so that its mass is not concentrated in the center. While other galaxies showed similar rotation curves, seeming to support the presence of dark matter, even Fritz Zwicky was skeptical. Gas and dust within a galaxy might exert some kind of drag on fast moving stars, he argued, thus flattening the rotation curves. But by the 1950s radio astronomy had progressed to the point where it could detect monatomic hydrogen through the famous 21 centimeter line. Radio observations of both the Andromeda galaxy and our own Milky Way galaxy showed similarly flat rotation curves. Since hydrogen is by far the most abundant element in the Universe, the results proved that not only stars, but the gas of any dark nebulae were orbiting the galaxies at similar speeds. Either galaxies contained significant dark matter, or our understanding of gravity was very wrong. As the evidence for dark matter grew, it soon became clear that there was a serious problem. Assuming our gravitational theories were correct, dark matter must be far more plentiful than luminous matter both in galaxies and among galactic clusters. If this dark matter consisted of things like dark nebulae, their presence should be detectable by the light they absorb. If so much dark matter exists, it must not only be non-luminous, it must not absorb light either. It couldn’t simply be regular matter that is cold and dark, but must be something very different. This was such a radial idea that many astronomers questioned the validity of Newtonian gravity. By the 1980s several alternative gravitational models, the most famous of which was Modified Newtonian Dynamics (MoND), proposed by Mordehai Milgrom. While these models did work well for things like dwarf galaxies, they worked horribly with things like galactic clusters. Dark matter models were not without their problems, but they agreed more readily with observations. 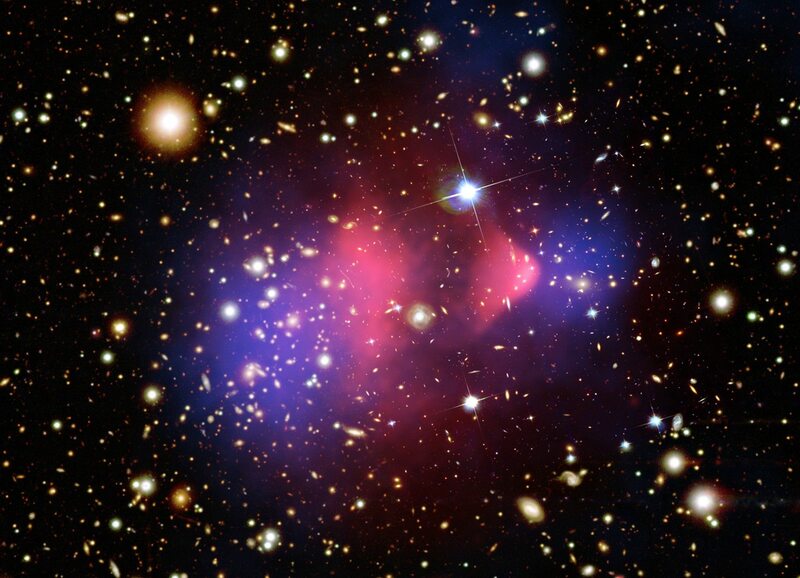 Dark matter in colliding galaxies like the Bullet Cluster show us how dark matter behaves. Credit: X-ray: NASA/CXC/CfA/M.Markevitch et al. 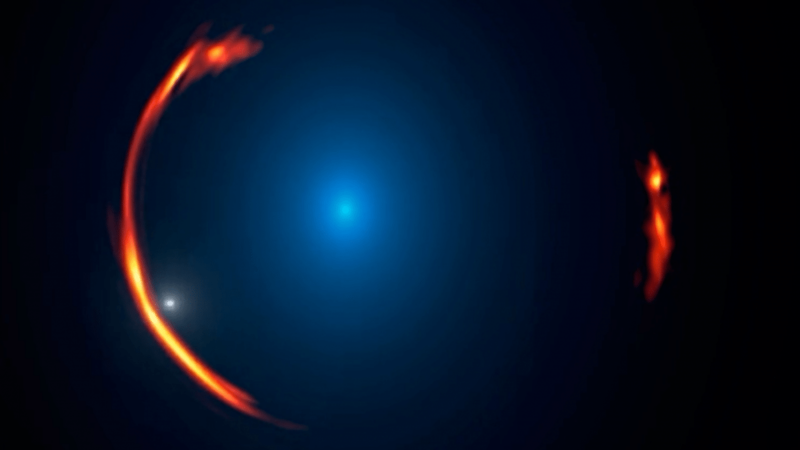 ; Lensing Map: NASA/STScI; ESO WFI; Magellan/U.Arizona/ D.Clowe et al. ; Optical: NASA/STScI; Magellan/U.Arizona/D.Clowe et al. In the past couple decades data gathered from gravitational lensing and deep sky surveys have allowed us to further refine our dark matter models. From the large scale distribution of galaxies we know that dark matter must be cold and slow moving, so the countless neutrinos that zip through the cosmos at nearly the speed of light cannot account for dark matter. 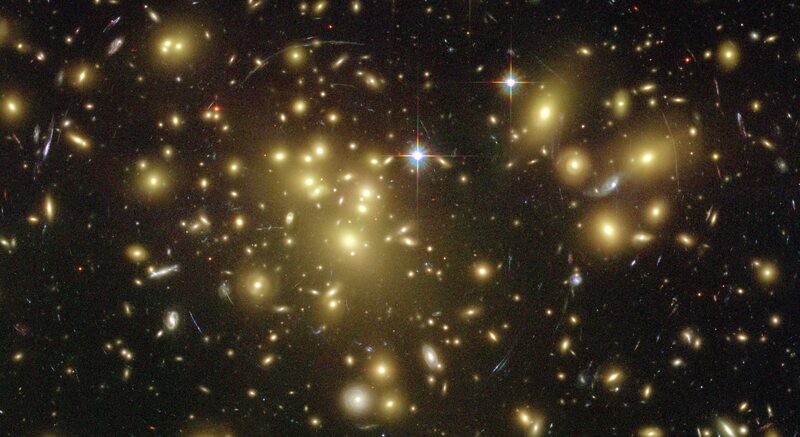 From gravitational lensing we know the distribution of dark matter within galaxies. By observing the distribution of dark matter within colliding galaxies we know that not only does dark matter not interact with light, it also doesn’t interact strongly with regular matter or itself. While this further verifies the existence of dark matter, it also makes it more difficult to determine just what dark matter is. The most recent challenge for dark matter has been to determine its composition. The most popular idea is that they are Weakly Interacting Massive Particles (WIMPs), but these particles should be detectible by the same experiments used to observe astrophysical neutrinos. So far, no evidence for these particles has been forthcoming. Direct efforts to detect dark matter have only served to eliminate our options for dark matter. After studying dark matter for more than a century, it continues to elude us. And so the dark history of dark matter continues. There should have been a mention to the work of Vera Rubin in this article. Maybe I’ll do a whole post on her sometime. … I keep feeling as if Dark Matter is a stub theory, one which serves cosmology’s purposes, not as a particularly explanatory thing but to keep the old Zwicky equations working. The same goes for MoND, which as you observe on the Forbes site, has its own shortcomings. I sense, as with the cosmological constant Λ , which Einstein used as a stub to make his equations work, saying it was his greatest blunder – it wasn’t, of course – the equations will get better as the observations improve. But Dark Matter just isn’t explanatory. MoND serves just as well and it’s simpler. Or so says this non-astronomer civilian type…. Radial idea ? Surely Radical ? Sorry, got my pedants hat on this morning…. What implications are there for dark matter if the paper “The Radial Acceleration Relation in Rotationally Supported Galaxies” discussed here (https://www.sciencedaily.com/releases/2016/09/160921085052.htm) Is validated?